Hello Window Insiders, and greetings from the Microsoft Edge team! With the next release of Windows (RS4) just around the corner, we wanted to say “Thanks!” to our Windows Insiders. Your feedback has helped make this new version of Microsoft Edge our best yet. In this article, we’d like to explain just how important Insider feedback is to our development process. 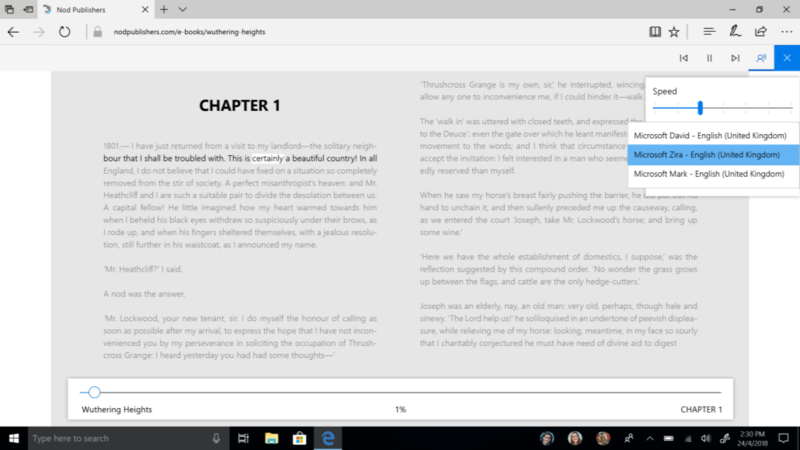 We’ll also highlight several features and fixes that made it into the Windows 10 Spring Creators Update (RS4) – in large part, because of the comments and suggestions from Insiders like you. What do we do with Insider feedback? It’s worth repeating: we love getting feedback from Windows Insiders. Checking Insider feedback is a regular part of our engineering process. Here on the Microsoft Edge team, we have a group dedicated to tracking Insider feedback on a daily basis, both in English and across multiple languages. While we try to look at as much Insider feedback as we can, we pay especially close attention to those suggestions that get the most votes by Insiders. Based on your feedback, we’ve made substantial improvements to Microsoft Edge fundamentals such as reliability, performance and site compatibility. This includes important bug fixes made throughout the development process. Bugs are to be expected with early Insider Preview builds. But thanks to the sharp eyes and speedy feedback of Insiders, we were able to address these issues faster – much to the delight of our engineering team and the entire Insider community. Evolving full screen mode (F11). Windows fans have been enjoying this feature since the Fall Creators Update. In this next release, Windows Insiders helped make it better. We heard your feedback, and we updated the experience, so you can access the address bar (and navigate to other sites, add a site as a favorite, and more – all without leaving full screen. Instantly mute auto-playing media on websites. This was one of the most upvoted suggestions by Insiders for Microsoft Edge. Microsoft Edge now displays an audio icon that shows which tab is playing sound. Just click the icon to mute and unmute. Thanks to everyone who shared feedback requesting this handy feature. Form Fill for credit cards and address fields. Microsoft Edge can now save and automatically fill your credit card and address information on payment and related web forms. Thanks to Insiders for getting this prioritized for the current Windows release! Use Extensions when InPrivate. This was yet another great Insider suggestion with lots of upvotes. We heard your feedback and have added the ability to load extensions when Microsoft Edge is in an InPrivate window. You can grant individual extensions permission to run in InPrivate from the options menu for the extension. Windows Defender Application Guard (WDAG) updates. You spoke, and we listened. Microsoft is bringing Windows Defender Application Guard to Windows 10 Professional in the next feature update of Windows 10. While we gather feedback from a number of channels such as community and support forums, the Feedback Hub is still the one that gets the greatest amount of attention from our engineering teams. You can access the Feedback Hub in Settings – but you can also get to it directly from Microsoft Edge in the Feedback & Reporting pane. If you see an issue with a website or encounter a page that seems unsafe, you should continue to use the other options here, but if you have feedback on the Microsoft Edge web browser itself, click the link under “Microsoft Edge problems or suggestions.” Once you’re in the hub, you can search and vote for an existing issue or suggestion – or create your own post. As we look toward upcoming releases of Microsoft Edge, your feedback will continue to have ever-growing importance in planning and prioritization. In fact, as we’ve said before, our product backlog (a.k.a. “to do” list) is more influenced by user feedback than anything else. Thanks again for helping us build Microsoft Edge, and keep that feedback coming.